Regulations – In the earliest days of MMA as an organized sport, it wasn’t allowed on pay-per-view and Republican politician John McCain lobbied heavily for the FCC to keep mixed martial arts off PPV. In response, mixed martial arts leagues began to organize their fighters into weight classes and institute regulations to make the sport more palatable for the masses. With these changes, MMA began to move out of the underground circuits and into the mainstream. Gambling & Fantasy MMA – Where boxing was once the go-to combat sport for Vegas odds-makers, mixed martial arts is now taking its own piece of the action. 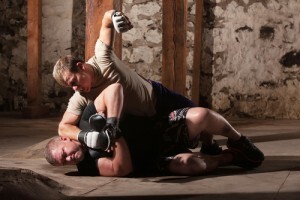 Betting on MMA fights is a booming business and fantasy MMA sites like http://www.kountermove.com are making it easier than ever to bet on MMA fights. The Ultimate Fighting Championship (UFC) – Mixed martial arts promotions like PRIDE and StrikeForce generated lots of buzz, but there is no doubt that the UFC put mixed martial arts on the professional sports map in the United States. The UFC entered the scene in 1993 and after a series of buyouts have positioned themselves as the top MMA promotion in the World. Social Media – In the earliest days of MMA as a mainstream sport, the Internet was just getting going and social media had yet to become an integral part of our lives. Now, athletes from all sports, including MMA leverage Instagram, FaceBook, Twitter, & others to create a stronger bond with their growing fan bases. Training Availability – It used to be hard to find gyms that specialized in MMA training with tae kwon do & karate being much more popular martial art forms. That has significantly changed now with the emergence of the Gracie Jiu Jitsu gyms, UFC gyms, and many others that combine traditional combative arts like jiu jitsu, kickboxing, and other styles to train MMA fighters. Diversity – MMA has always had cross-cultural but with the emergence of professional WMMA promotions like Invicta and introducing many more weight classes, MMA has opened up to more athletes offering female and male fighters of all sizes the opportunity to fight for a living (the number of weight classes for men and women is more likely to increase than decrease). Increased Understanding of the Sport – As MMA becomes a mainstream sport and expanded its rules and regulations it also has become easier for fans to understand. What was once seen as a blood sport by some politicians and some fans has become more appreciated for the technical skill required to become a pro fighter. Increased Promotion – Organizations like UFC and Bellator are working overtime to get MMA out there for public consumption. From reality shows that showcase up-and-coming fighters to aggressive multi-channel marketing campaigns that promote their Pay Per View (PPV) fights these promotions are marketing machines. Sponsorship Deals for Fighters – While athletes in any sport have sponsorship deals, MMA fighters take it to another level. From paid public appearances to walk–out shirts to the shorts they wear for fights, MMA fighters proudly represent brands like no other individual sport. It’s more like NASCAR than the NFL from this perspective. Accessibility – With networks like AXSTV, Spike, and FoxSports1 frequently running fights on the weekends it is far easier to watch high level MMA fights. MMA is a rapidly innovating and evolving sport which will continue to fuel it’s increase in popularity. As the UFC and other promotions cut deals like the massive uniform deal with Reebok in December 2014, we will see more and more merchandise and marketing of MMA athletes and promotions. This will continue to bring more fans to the sport for years to come. No matter how quickly it grows though it is clear that MMA is mainstream and it is here to stay.